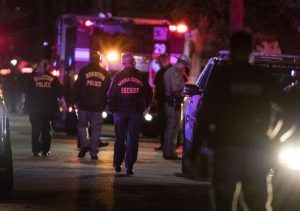 Four Houston police officers were shot and another suffered a knee injury on Monday, January 28, while serving a search warrant, according to police Chief Art Acevedo. A SWAT team took over the scene and sent in two robots to check the home. The images retrieved by the robots showed that the two suspects had been struck by return gunfire from police. The suspects were identified as 58-year-old Rhogena Nicholas and 59-year-old Dennis Tuttle. The two, according to Tuttle’s sister, Elizabeth Ferrari, were married. Undercover officers had previously purchased black tar heroin in the home. After the shootout, investigators found no heroin on the premises. Nonetheless, marijuana and a white powder, believed to be cocaine or the powerful prescription painkiller, fentanyl, were found. They also seized three shotguns and two rifles. Family and friends of the suspects were shocked to learn of the allegations. Ferrari said that she had spoken to her brother the week before and that he seemed to be “fine.” Generally, he and his wife had kept to themselves, but Ferrari was skeptical of the charges against him. Tuttle did not appear to have any local criminal history. His sister even explained that he’d been honorably discharged from the Navy. Nicholas had only one prior arrest in Harris County—a misdemeanor charge for a bad check. She paid restitution for the $100, and according to court records, a judge tossed the case. Three of the four officers who were shot are still hospitalized. The officer who suffered the knee injury was also being treated at the hospital. Two of the hospitalized officers are in critical condition, while the other two are in good condition. An officer who was discharged suffered a gunshot wound to the shoulder. 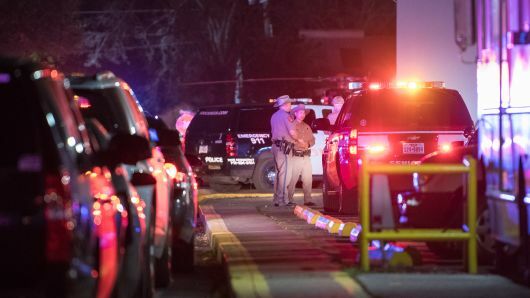 Both Acevedo and Michelle McNutt, chief of trauma surgery at Memorial Hermann-Texas Medical Center in Houston, provided updates on four of the officers, the family of the fifth officer having requested no information be released. The 54-year-old officer who “heroically made the entry” was shot in the face and required surgery. He is recovering, but the facial trauma team will have to perform more operations. Police said he had been with the force for 32 years. He is in serious condition but is stable. A 50-year-old sergeant who suffered a gunshot wound to the face required no surgery. The officer, who has 25 years on the force, was released Tuesday afternoon. Another 50-year-old sergeant, a 27-year veteran who suffered the knee injury, is recovering and will be released soon. The first officer through the door, a 33-year-old, was shot in the shoulder and discharged from the hospital. The officer has 10 years on the force. The officer whose family requested privacy is 40 years old and a nine-year veteran of the police department. He is in stable condition. None of the officers’ names have been released due to their undercover work.